This is my first Kid’s clothes week, and it’s going very well! The theme is Upcycled, meaning, sew a piece of clothing for your kids, one hour a day, using old clothes. I’ve used old clothing to make new ones, before, as you can see here and here, but it’s not my favourite thing in the world. I prefer the smell of new fabric! ;D I decided to give it a go, anyway, mainly, because my partner wanted to replace most of his t-shirts, and gave all the old ones to me, in case I wanted to do something with it. And it’s a good thing he did! 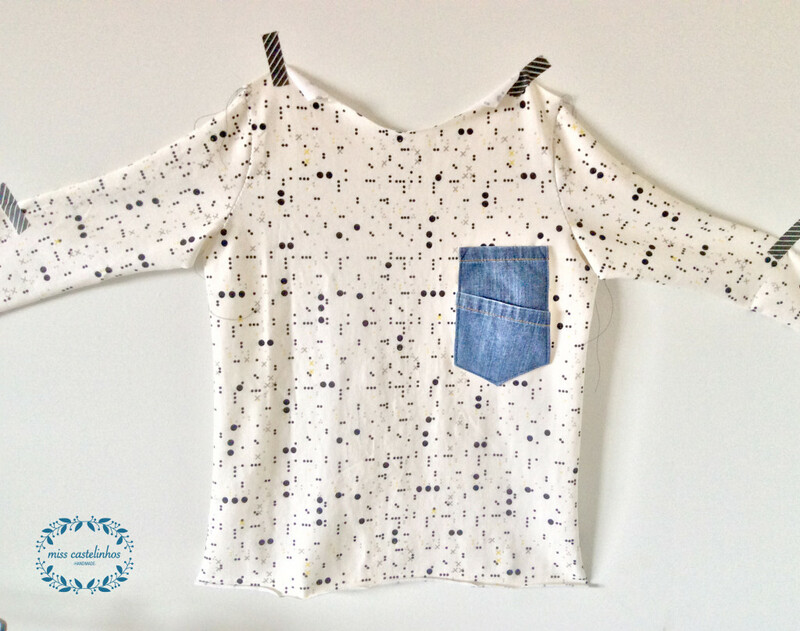 So I had plenty of fabric, no problem there, I could sew anything I want… and what to do I choose… (drum roll)… a T-SHIRT! (mind blowing, I know!) But not just any t-shirt, a Rowan Tee! And there’s a good reason for this, my oldest son wanted a t-shirt, like the one I made for his brother, and I couldn’t say no to that! He even drew me how he wanted the pocket in the front (adorable!). Besides the old t-shirts, I decided to use, also, an old denim shirt of mine, so I could make it a bit cooler. thank you for beautiful artwork!